This Friday, December 5th, 2008, marks the 75th anniversary of the repeal of prohibition! So along those lines I felt it appropriate to feature a cocktail created during that unpleasant time period. With much fanfare I present to you the French 75. Photo courtesy of Wikimedia member PHGCOM. Thanks! Ok, so that’s not really a cocktail, but it is the cocktail’s namesake. 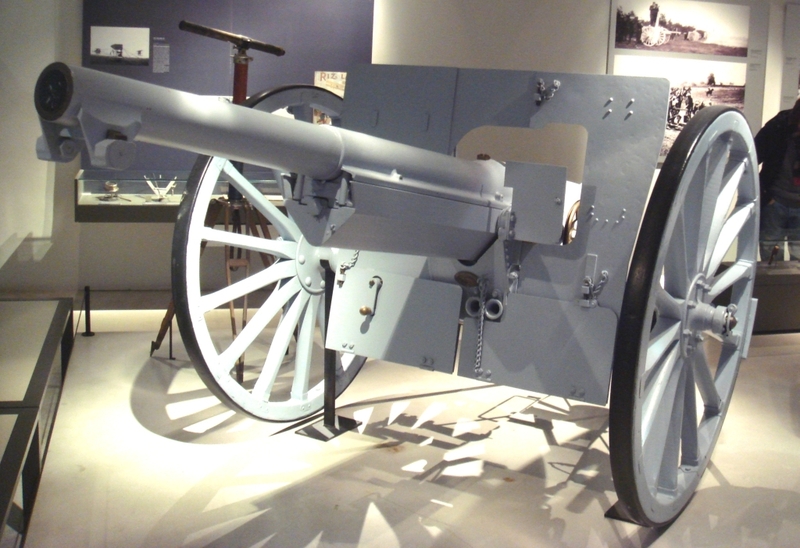 That is the 75mm French Field Gun used by the USA’s National Guard troops when they joined World War I in 1917. You see, we were a bit behind the times in equiping the National Guard with good artillery. To the tune of 20 years behind the times to be exact. So, when our troops arrived in France the artillery teams were issued the French 75. Which had a number of creative (and deadly) developments, which, if you’re so inclined, you can read about here or here. The cocktail came about a bit later, although I’m not clear on the exact time, during WWI. It was created by Raoul Lufbery, a flying ace during WWI. It’s said that Raoul liked Champagne, but wanted something with more kick so he added (here comes the weird part) a bit of Cognac. The resulting drink had enough kick that after drinking one you felt as though you’d been hit by a round from the French 75. So, why is the Cognac odd you ask? The first published recipe for the French 75 lists the drink as made with Gin and Lemon juice (The Savoy Cocktail Book via The Joy of Mixology). It seems that the recipe listing Cognac as an ingredient didn’t come about until Embury’s book (also via The Joy of Mixology). Now you note the oddity. Never fear, we here at CH are here to ferret out what’s tastiest in the name of science and I’m going to give both variations a try. My starting point will be the recipe from David Wondrich published on Equire’s Website.